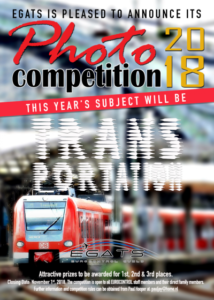 The 2018 EGATS Photo Competition is open to all EUROCONTROL present and retired staff members and their direct family members. So for all of you – and partners and kids! – who are keen photographers, this is a chance to have some fun and enter pictures in this year’s competition. The topic is broad: you can submit photos related to any kind of transportation method. Three valuable prizes will be offered to the winners and, the competition closes on 1 November 2018. Click on Read More for the detailed rules. Each entrant may submit a MAXIMUM of three photos. Photos may be taken in any format but MUST be submitted in digital form. Entries may be submitted in color or black & white, however, prizes will only be presented to the overall winners. Photos should have been taken by the competition entrant within the one year period preceding the competition closing date. In fairness to all entrants this rule will be strictly applied and confirmed by reference to the photo’s Exif file. Post exposure processing of photos will be permitted. If no Exif file is attached to the photo please include as many details as possible e.g. camera/lens used, exposure details, location, date and time of day etc. **It would help to identify your photos if you would give each one a brief title** NEW! Photos MUST be reduced to a file size of around 5mb in order to ease handling. Free software can be found online for this. The competition organiser reserves the right to submit entries to the competition, but will not be eligible for prizes. Entries should be submitted via email to Paul Hooper at [email protected] as JPG files. Entrants should advise Paul Hooper if they would prefer their photos NOT to be published or displayed after the closing date. Copyright shall remain with the photographer. Entries must be received by 1 November 2018. By submitting photos to the competition you will have indicated that you have read, and agree to abide by, these rules. Photos not meeting these requirements will be deemed ineligible and will be removed from the competition.